Here are some facts about Edinburgh Castle in Scotland. 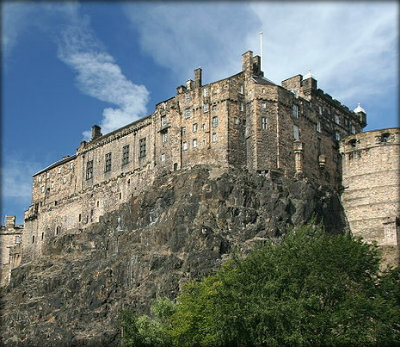 Edinburgh Castle is built upon the massive Castle Rock, part of an ancient extinct volcano. The top of Castle Rock is more than 120 metres above sea-level and it stands 80 metres taller than the land surrounding it to the north, south and west. 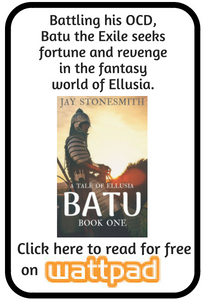 It can only be easily reached from the east. 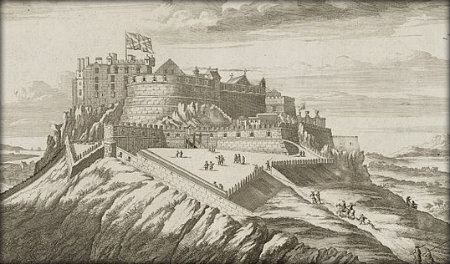 The evidence, both archaeological and written, for the early history of Edinburgh Castle is patchy. Little can be said with certainty about this period in the history of Castle Rock and the buildings which sat upon it. It is believed that people in the late Bronze Age lived on top of Castle Rock. Nobody knows for certian when the first castle was built on the site. Some think that a hill fort was constructed on Castle Rock during the Iron Ages. Apparently, a band of warriors feasted in the castle for a year before fighting to the death in a battle against the Angles. There is some evidence to suggest that Queen Margaret (the wife of King Malcolm III) was staying at Edinburgh Castle (or Maiden’s Castle as it was referred to then) when she heard of her husband’s death. Edinburgh Castle was an important royal site in Scotland during the reign of Malcolm III and his descendants. King Edgar, Malcolm III’s son, died in the castle. King David I spent much of his time at Edinburgh Castle, making it the main centre of royal power in Scotland. The exact nature of the castle is not known. It is thought that the main building material would have been wood, but stone buildings from this period (the 12th century) have been found – for example, St Margaret’s Chapel. During the 12th century ownership of Edninburgh Castle switched from Scotland to England and then back to Scotland again. The castle changed hands several time between Scotland and England during the Wars of Scottish Independence (13th and 14th centuries). In the 14th century, King David II and Robert II, David’s successor, set about rebuilding parts of Edinburgh Castle. They added David’s Tower. In the 15th century, the castle was used as an arsenal (a place where ammunition and weapons are stored and made). The castle was used as a prison in the 18th century and early 19th century. Prisoners from the Seven Years’ War, the American War of Independence, and the Napoleonic Wars were locked away in the dungeons over the years. It was also used as a prison during World War I. The castle in Edinburgh is now one of Scotland’s biggest tourist attractions. Here is a link to the Primary Facts Castles Reources page. this website helped me with my work in class,i loved it!! Keep the good facts up! Thanks, it helped me so much with my project!!!!! !